It is hot in Minneapolis, not just hot but nasty, sticky hot with heat indexes over 100 F. We deal with -20 F much better than this kind of weather. I don't know about all of you but it has really taken away any inspiration to cook or even eat much. Luckily, the garden & farmers market are full of all we need to make some nice chilled gazpacho, the perfect hot weather dinner. The tomatoes in our garden are starting to ripen, It seems like with tomatoes you go from famine to feast overnight. Here is just one bunch on one plant of our Brandywine plants about two weeks ago. Now most of them are red & absolutely huge! Brandywines can get to be from 1 to 1 1/2 pounds each! 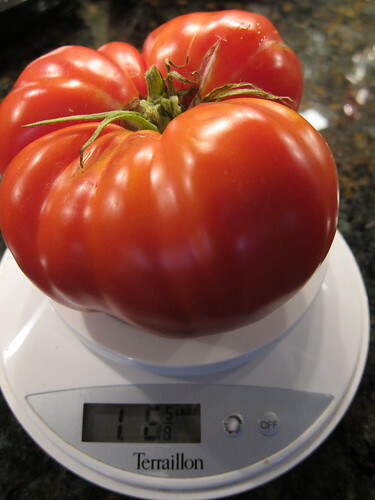 They really are the perfect tomato for gazpacho, juicy & fleshy with a sweet flavor. They pair wonderfully with the cucumbers & peppers that are also in season now for a crisp, fresh flavor. I like this recipe because it uses a lot of tomatoes & doesn't use tomato juice like almost every other one I've seen. I changed the red & green peppers typically used in gazpacho for a poblano & a banana pepper. I feel like these peppers had a lot more flavor & added just a little bit of heat. Really it ended up being one of the best batches of gazpacho I've ever made, the closest to those I remember having in Spain. In a food processor or blender process the cucumber, peppers, onion, garlic, olive oil, vinegar, sugar, salt & pepper until smooth. Pour into a large bowl. Add the tomatoes & bread to the processor & process until smooth. Stir into the bowl with the cucumber mixture. Mix well. Cover & chill for at least a couple of hours. Taste for seasoning & add salt & pepper as needed. Serve with garnishes like diced cucumbers, peppers, red onion or sweet corn. Crusty croutons would be good as well. That is one gorgeous tomato!! I love Brandywine but the ones we planted last summer were either eaten by critters or developed end rot. Sigh. We didn't plant any this year so I'm going to stare at your photo and remember . . . This recipe sounds perfect for your lovely produce! I'm waiting with decreasing patience for my tomatoes. Our summer doesn't work perfectly with tomatoes. I dream of having this many! We didn't plant any tomatoes this year either, and so I'm completely jealous of your abundance. Gazpacho for a hot week like this? Yum! I am jealous of your tomatoes! The gazpacho sounds and looks fabulous. That's one of my favorite summertime treats--it's always so fresh tasting. Also love the choice of peppers! We had a great gazpacho at the club this week made, like yours with poblano peppers. It had a nice touch of heat to it. I am now thinking about gazpacho bloody marys. Your Brandywines are beautiful! Unfortunately it has been a bad year for tomatoes here. Everyone is complaining about it, even the farmers at the FM. They aren't ripening well and rotting quickly. We have managed to get plenty for us because we planted several plants, but so far only one decent Brandywine so I'm jealous! This heat is suffocating! 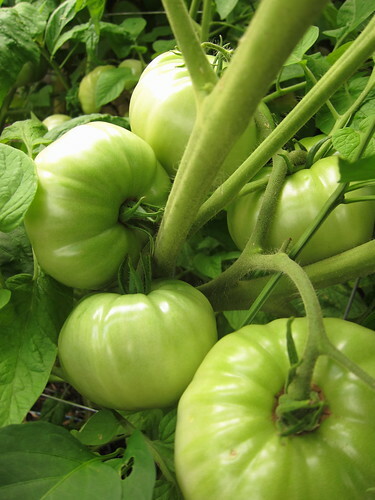 When our tomatoes go from green to red, we're going to have an abundance. I'm amazed by how many grew this year when virtually none did last year. That brandy wine looks awesome. I need to try that tomato next year. My star of the garden this year is by far the Cherokee Purple. Although the San Marzano's look pretty good. The tomatoes are coming fast and furious. I am actually going to can some today. I usually do a gazpacho every year. Sometimes I do not like chunky I will try your puree version this time. To be honest I am not a warm weather kind of girl. Above 80 is just too hot for me. Okay now everybody don't throw tomatoes at me for saying that (ha ha ). Those are some incredible tomatoes. So perfect for gazpacho which should be declared the dish of summer. With all those tomatoes as a perfect ingredient for a cold soup, what is there not to like? Just made this gazpacho recipe last night. You're right--it is the closest that compares to what I ate in Spain over my various years of study there. Thanks so much! SAWM - I'm so glad to hear you liked it too! that's a behemoth of a mater if ever i saw one! 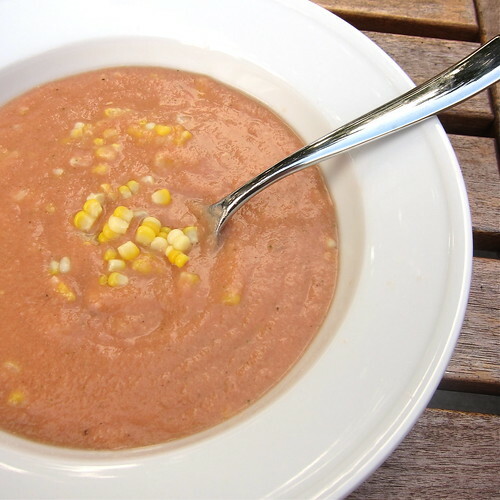 great gazpacho--i love the corn on top! I'm so frustrated because all of our tomatoes, except the cherries, are still green. I don't remember ever having to wait this long for tomatoes! But this sounds like a great way to use them up once they do start turning.